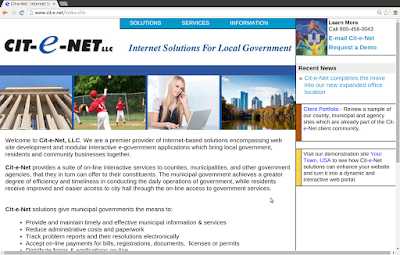 "We are a premier provider of Internet-based solutions encompassing web site development and modular interactive e-government applications which bring local government, residents and community businesses together. Our web-based applications can help your municipality to acheive its e-government goals. Type & click website content-management empowers the municipality to manage the website quickly and easily. Web page styles & formats are customizable by the municipality, and because the foundation is a database application, user security can be set for individual personnel and module applications. Our application modules can either be integrated into your existing municipal web site or implemented as a complete web site solution. It's your choice! 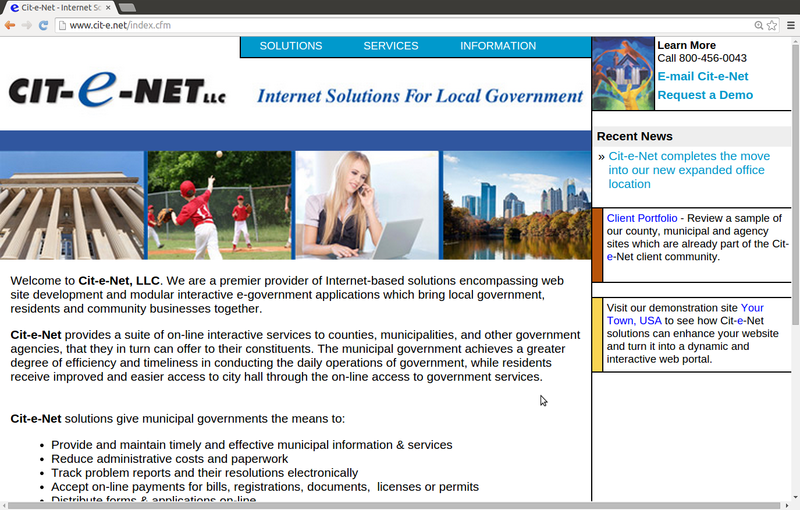 Please contact us at info@cit-e.net to view a demonstration of our municipal web site solution if you are an elected official or member of municipal management and your municipality is looking for a cost efficient method for enhancing & improving municipal services. Submit Volunteer Resume's Online for the municipality to match your skills with available openings." Cit-e-Access web application has a security bug problem. It can be exploited by XSS attacks. This may allow a remote attacker to create a specially crafted request that would execute arbitrary script code in a user's browser session within the trust relationship between their browser and the server. Several similar products 0Day vulnerabilities have been found by some other bug hunter researchers before. Cit-i-Access has patched some of them. Open Sourced Vulnerability Database (OSVDB) is an independent and open-sourced database. The goal of the project is to provide accurate, detailed, current, and unbiased technical information on security vulnerabilities. The project promotes greater, open collaboration between companies and individuals. It has published suggestions, advisories, solutions details related to important vulnerabilities and cyber intelligence. (2.1) The first programming code flaw occurs at "/eventscalendar/index.cfm?" page with "&DID" parameter in HTTP GET. (2.2) The second programming code flaw occurs at "/search/index.cfm?" page with "&keyword" parameter in HTTP POST. (2.3) The third programming code flaw occurs at "/news/index.cfm" page with "&jump2" "&DID" parameter in HTTP GET. (2.4) The fourth programming code flaw occurs at "eventscalendar?" page with "&TPID" parameter in HTTP GET. (2.5) The fifth programming code flaw occurs at "/meetings/index.cfm?" page with "&DID" parameter in HTTP GET.